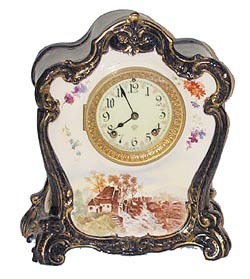 Ansonia Clock Co., Royal Bonn case, "La Don", ca 1901. A beautiful cobalt blue case, painted scene of a house, watermill, flowers, and an abundance of gold designs on all sides. Case is 12 inches high, 10 inches wide. Round French type movement, signed by Ansonia. 8 day, half hour gong strike, running. Correct pendulum, a hinged metal back door. French sash, beveled glass, one piece porcelain dial with a few faint hairlines. This is one of the prettiest Royal Bonn\'s we have had. It is not shown in the new Ansonia book, probably in an earlier catalog. It has all the proper Ansonia markings on the case.